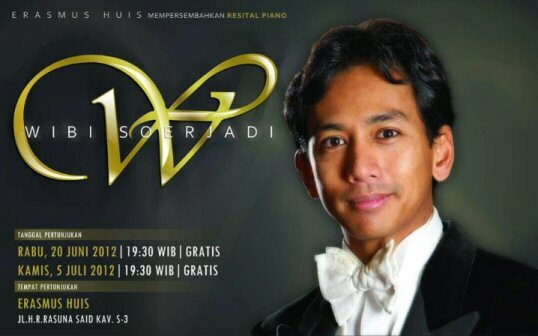 Wibi Soerjadi is a Dutch pianist who was born on 1970 in Leiden. Judging from his name, I am pretty sure that his parents are (or were) Indonesians. Supported by Erasmus Huis (and others sponsors), he came to Jakarta and held a free recital Piano which took place in Erasmus Huis few hours ago. Since it’s classic and free, I went there. VIP guests were queuing to get into the building when I arrived. It was 45 minutes before the recital and I was already on number 63 of the waiting list. After the VIP guests got into the building, only 48 people allowed to get into the room. So, the unlucky-me ended up outside the building, sitting in front of a big screen, next to a very annoying man-who-does-not-like classic. Like me, he came because it was free. This guy was in the waiting list number 112, so I decided to address him as “112 man”. This 112-man talked to me and kept talking, although my eyes were glued to a module that I found in my bag. My attempt to ignore him failed, he kept talking and told me that he prefers rock music rather than classic. Before listening to the music, he decided to stay for one round (satu babak!) only. Then he started to talk about the lost of the Netherlands during the world cup and the bla bla went on until the pianist showed up. Soerjadi opened the program with a piece from Mozart, titled “Adagio” from Concerto KV 488 (Soerjadi), and followed by Bach (Feruccion Busoni) piece, Toccata and Fuge in D-Moll BWV 565. He then continued with “Adagio” un poco mosso from concerto no. 5 opus 73 (Soerjadi) and before the intermission he pampered our ears with a piece from Vincenzo Bellini (Franz Liszt), Réminiscences de Norma S. 394 (doca Soerjadi). After 15 minutes of intermission (and lot of chips and soft drinks for everyone), the talented man went back to the stage to pamper our mind, heart and ears. I found that the second session of this recital was more interesting. During this session, he played only his compositions and started with a piece titled ‘Fearless’. When Soerjadi was playing his second piece, a tribute to her mom, titled ‘To Mom’ a phone rang and the owner did not realize until few seconds. Oh come on, it was a beautiful tribute to his beloved mother. I went to few recitals piano and other classic performances (even jazz concert) and during the performance (be it free or no) there’s always, at least one, idiot who forgot to switch off the mobile phone. I think Erasmus should stop providing snacks, soft drink or beers to spectators and start to invest on a good signal blocker. Well if it is too expensive, then banned any kind of mobile phone from the building and provide a good locker for this (@ America knows better how to do this). At the end of his performance, Soerjadi played a nine-part composition titled “Apuleius’ Amor & Psyche”. This composition was written on 2009 when he was suffering from idiopathic sudden sensor neural hearing loss. It was the best part of the show as it was so beautiful. My favorite from this piece about Amore and Psyche are the Sinfonia (Overture) and the third part about Psiche. The latter sounds very feminine and soft to my ears. Just beautiful! He, of course, got a standing applause for his brilliant performance and as a reward for the spectators (for standing, LOL), he gave an encore, music from “Pirates of The Caribbean”. The best part was that the he played only with one hand, the left hand. Super awesome!!! The second encore was “Bengawan Solo”, a very beautiful Indonesian song written by Gesang. I am sure somewhere in heaven, Gesang listens to his performance and very proud of this talented man. Soerjadi released his first CD titled “Dance of Devotion” on 2008 and the CD contains only his compositions. Unfortunately the CD was not available in Erasmus. If you are interest to see his great performance come to Gedung Kesenian Jakarta, tomorrow, 18 September 2011 at 20.00 (only if the ticket isn’t sold out). Well, if you can’t get any ticket, then wait until next year, he’ll be back and hopefully he will remember to bring his CDs. Anyway, it was so awesome that the 112-man stayed until the end of the performance. Amazing huh? To read more about this talented pianist, click his website he is also in twitter. This entry was posted in English, Jakarta, Music and tagged Classical Musique, concert, Dutch, Mozart, music, Pianist, piano, Wibi, Wibi Soerjadi by Tjetje [binibule.com]. Bookmark the permalink. Saya telah mengoleksi beberapa permainan resital-nya Wibi Soerjadi. Termasuk juga video pasca kecelakaan yg hampir saja membatalkan konsernya. Dengan kaki yg masih tertatih-tatih ia mampu menyelesaikan konsernya dg tuntas, meski sempat terhenti di tengah permainannya. *Salam kenal ya, dan ini jejak pertama di rumah baru mbak Ailtje. Terimakasih telah mampir di rumah baru saya. Masih perlu dibersihkan dan ditata. Senang menemukan cerita tentang konser Wibi Soerjadi ini, jadi membayangkan serunya. Saya baru bisa menonton permainannya melalui youtube sejauh ini. Semoga sempat menonton secara langsung, karena memang keren sekali! Terimakasih atas kunjungannya. Semoga bisa nonton langsung dan mengagumi skill – nya yang luar biasa.